This post has been sponsored by Donor Egg Bank USA. I have received compensation to share this content. I was only 32 and married for just four years when my husband and I received a diagnosis that would define a large chapter of our lives: unexplained infertility. The diagnosis led us to explore many options for starting our family that we had never envisioned; no one really ever anticipates infertility and how challenging it can be to overcome. Here’s my story of how I tried just about everything, and how egg donation gave us an answer to our infertility challenges. Like many couples, we tried intrauterine insemination (IUI), followed by rounds of traditional in vitro fertilization (IVF), which left us feeling stuck in a cycle of hope and defeat. At first, we produced lots of seemingly healthy embryos, but we were not able to conceive with them. In retrospect, one piece of advice I offer to other women going through infertility is to ensure their clinic uses best practices. Ours froze our embryos a little too soon, which may have affected our unfortunate outcome. 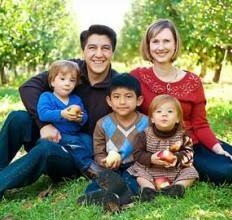 After several rounds of IVF, we moved on to adoption and started our family with our wonderful son from Guatemala. Not long after that, we fought hard to adopt again, this time a little girl, but the country closed its borders to adoption and we lost her. After mending our broken hearts, we turned to an alternative we had not yet explored: egg donation. Egg donation was a blessing for our family for so many reasons. With the years that had passed between trying to conceive and then going through the adoption process, my body’s egg count had gone down, as it does with every woman over time. Plus, I knew that eggs can have more genetic abnormalities as they age. In my situation, using a donor egg meant I could more likely conceive and carry a baby to term. Becoming pregnant and delivering a child was something I had always dreamed of, but all those failed cycles had led me to believe it just would not happen for me. After switching fertility practices, my husband and I set to work to find an egg donor. As a healthcare professional, it was important for me to find a donor who had a similar level of education. Other moms may have other qualities they are seeking in an egg donor. Choosing a donor is even easier now, as couples can choose donors from online databases where the donors are prescreened. Once we had selected the egg donor, the process was all too familiar. We had, after all, already gone through IVF. First, the clinic fertilized the donor eggs. For many couples, using the husband’s sperm provides a longed-for genetic connection, while some women choose a sperm donor instead. After a few days, the eggs developed into embryos and were ready to be implanted. Our two embryos were considered mediocre, and we had to prepare mentally for the possibility of another huge disappointment. I had taken medications in advance so that my body was hormonally ready to give the embryos their best chance to implant in my uterus. Those two embryos made it, and we were thrilled to give birth to twins! After so many attempts, all the frustration and feelings of inadequacy, we had not only adopted the delightful child we are privileged to have as our son, but I was also able to experience pregnancy, which I had almost written off. Our family was finally complete, and we were elated. Every infertility story is different, and at the point where we considered egg donation, I had already been through the tumultuous emotions of feeling let down by my body and being emotionally knocked down by every baby shower invitation and baby announcement. So, for me, the idea of using a donor egg was more hopeful than anything. However, many women have shared with me that they needed time to grieve the fact that using a donor egg would mean losing their own genetic tie to the baby. It’s normal to take the time to work through those feelings, but I have also reassured these women that the bond they will forge with the baby while he or she is growing and developing inside, hearing her voice and sharing her experiences, is truly amazing. Heidi Hayes is the CEO of Donor Egg Bank USA. She has more than 20 years of healthcare experience and has worked extensively in the field of reproductive endocrinology. Having been unsuccessful at traditional IUI and IVF treatments, Heidi personally understands the struggles of infertility. After many years of trying to conceive, she ultimately built her family through adoption and donor egg treatment. She always believed that if she didn’t give up, her ultimate goal of becoming a parent would someday become a reality.